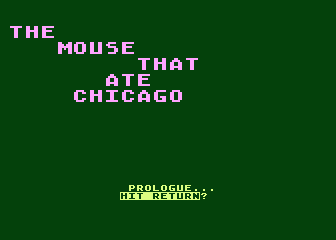 It's time for another of the SoftSide disk magazine adventure games, as we tackle the Atari 400/800 version of SoftSide Adventure #15 -- The Mouse That Ate Chicago, published in August of 1982. As usual, the author is uncredited onscreen or in the code, but based on certain stylistic similarities I am guessing this one is by the similarly anonymous author of SoftSide's Robin Hood Adventure. "Four man-eating mice are threatening to munch away on the city of Chicago. Each has its own specific weakness, and it's your civic duty to determine what these weaknesses are and destroy these horrible monsters. WARNING: Getting too close to a mouse can be very dangerous to your health - they love stepping on people." 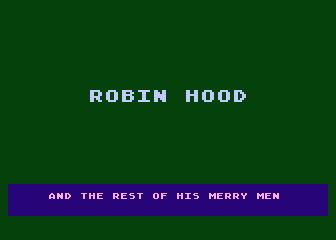 The game's structure is similar to Robin Hood Adventure -- there's a linearity to the story that's not immediately obvious, Atari 400/800 sound effects are prominent, and the same klaxon sound and flashing screen accompanies the player's death, though it's less incongruous here than in Sherwood Forest. 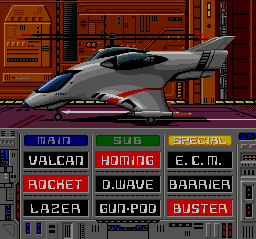 Something different is that the game begins with a non-interactive prologue segment, setting the stage as the then-future events of October 19, 1995 unfold. The prologue is non-interactive, displaying several screens of text. In A SMALL LABORATORY OUTSIDE OF CHICAGO ILLINOIS, a mad scientist named Professor Rainier Frankenfeld scolds his assistant Hans as he prepares to test his enlarger. We know the Professor is not a real scientist, or even an engineer, as he pulls a diamond out of his pocket and says, "This, Hans, this diamond will be enlarged ten-, perhaps twenty-fold..."; clearly he hasn't done his calculations with any great degree of precision. He also seems to think that he will now be "the possessor of the world's biggest diamond", discounting the possibility of other people using his technology to enlarge other diamonds that were, perhaps, larger to begin with. All this is set aside, however, when Hans' cheeseburger drips onto the high-precision platform, somehow unnoticed, and a mouse scampers up to check out the cheese..
One week later, the player takes over. We are joyriding in our jeep on a country road, but suddenly we run out of gas. Bad planning always costs our hero some sympathy on my part, and all we have with us is a wallet containing $39.98. The country road continues infinitely to the east. To the north we find a smashed gas station, and a laboratory. The gas station is falling apart, too dangerous to enter, though somehow we are able to recognize that the smashed facility Looks like giant mouse prints. The laboratory contains a machine, with a green pushbutton labeled #2 and a RESET switch. A platform with two laser-shaped rods lies to the east, and another machine with pushbutton #1 bookends the apparatus. The machine doesn't seem to be functioning at this time, but I eventually figured out how it works. In the forest south of the laboratory is a quicksand bog, and not much else; it's a minor maze, but every direction but the bog itself leads back to the forest entrance location. We aren't allowed to GO BOG. To the west is a bridge over the Chicago River -- the sign reads WEIGHT LIMIT 250 LBS. We're apparently in acceptable physical condition, as we can safely GO BRIDGE. On the other side of the bridge, we witness an odd vignette -- a man running for his life as his wife runs after at him, yelling at him for leaving her and the kids. She hurls a saucer at him that falls into the river, and then they both run off down the road. We can also reach a small town on the west side of the river, or by traveling south and west through the forest, where the Chicago River mysteriously does not appear to impede our progress. There are a number of houses in town, but we can't enter any of them -- we're consistently informed that It's not your house unless you're a cat burgalar [sic] (besides, no one here owns a cat). This proves to be an oblique hint, but its purpose is not clear at this time. If we visit later in the game, all the houses are smashed. A paved road to the north bears a more informative sign: CHICAGO 5 MILES. This implies we may not be getting there any time soon, but we can actually head just a few locations to the north to find ourselves downtown. The giant mice wander randomly around the map, though most are limited to certain areas. The first giant mouse we are likely to find early on, ** MAJA **, is seen to be carrying 3 other small rodents by the tips of their tails in his mouth. There's a hardware store to the east; the storekeeper has a high-powered rifle on hand. GET RIFLE yields Gun is $39.99, exactly one more penny than we have, of course. But if we wander a bit after learning this, we are likely to meet a YOUNG LADY, presumably the source of the unattributed "A penny for your thoughts" quote displayed onscreen when we see her. We GIVE THOUGHTS, and she gives us a penny. Clearly this is not meant to be a naturalistic story! She only appears after we have investigated the price of the rifle. Now we can GIVE MONEY and get the rifle from the hardware store. 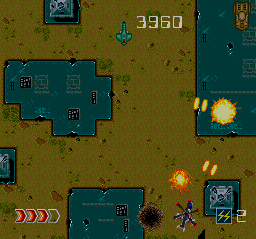 Running into one of the mice outside, we may try to SHOOT PUJI (for example) -- the game produces a nice gunshot sound effect, but Bullets bounce off. This is true of all four of the giant mice -- MAJA, PUJI, FIJI and SAM. There's a pet store in the area, too, but the proprietor is apparently OUT TO LUNCH, and the same goes for the music store. But the grocery store is open, and the storekeeper says, "In celebration of our 5th anniversity [sic], no charge today for anything." We are then prompted, What do you want? (One word, please) -- CHEESE seems the obvious response, and we end up with some smelly limburger cheese. A mountain at the end of the road contains a large cave... which contains the CHEWED BODIES OF... PROFESSOR FRANKENFELD and HANS. Good thing we read the prologue or we would have no idea who these people are... were; we can't do anything with the bodies, it seems. Exploring the streets of downtown Chicago, we find mouse SAM sitting atop the Hancock Building, swatting at planes and dropping bricks and mouse droppings on the populace. There's also a BURNING MERCHANDISE MART, but the wind tends to blow us around so we can't enter any of the buildings or facilities, including the FALLING STAND, an OIL BUILDING, and a CRUMBLING MARINA CITY. GO QUICKSAND in the forest is fatal, it's just that GO BOG isn't recognized by the parser. Despite the game's opening warnings, the quicksand is much more reliably fatal than the giant mutant mice, though they do occasionally spot us and stomp on us if we stick around too long. We can GO RIVER and see the SAUCER thrown earlier by the wronged spouse, lying at the bottom. But we don't have time to pick it up -- we GASP...PANT...CHOKE and pop up for air immediately. If we HOLD BREATH first, then we can take it and return to the surface manually. So now we've rounded up a few props, but what can we do about the giant mice? Well, I had to look at the code to get some hints here. We've mapped everything out, it seems. But there are a few missing items we haven't seen -- a bottle of milk, a flute, and a cat. Hmmmm. Okay, we can get free MILK at the grocery store as well. We can't PUT MILK, but we can POUR MILK -- except There's nothing to pour it into. If we DROP SAUCER and POUR MILK, we end up with a SAUCER OF MILK. Okay. Apparently we need to get a flute from the music store and a cat from the pet store when they are open. We can't get them from the grocery store, at least, and those seem like the logical sources. 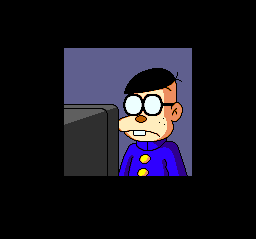 So it's time to see what we can accomplish while we wait for certain storekeepers to get back from lunch. It turns out we can electrocute a mouse by shooting the powerlines along the road to Chicago -- I was able to take down PUJI this way -- as noted in the intro, each mouse has a specific weakness, and fortunately each one tends to hang around where we can arrange the appropriate demise. To use the laboratory machine -- it does work -- we have to put something on the platform, push the reset switch, go east to push button #1 and come back to push button #2. We can use it to turn the CHEESE into GIANT CHEESE. Now we can go to the forest near the bog and PUT CHEESE -- Ok... you drop it on the quicksand. FIJI falls into the quicksand, and all we see afterward is his PROTRUDING MOUSE TAIL. Oddly, we hear his panicked squeaking coming from the south even if he's right next to us in the forest in the turn just before he passes on. So that's two giant mutant rodents down. Can we knock SAM off of the Hancock Building? Neither SHOOT SAM nor SHOOT BUILDING does anything interesting. But now the music store is open? This is one of those games where we have to do certain things in a linear order. The music store is also giving things away free on its 7th anniversity [sic], so we can get the FLUTE here. How we would know this without peeking at the code I really don't know -- recollecting the Pied Piper story, maybe? Three mice have been killed off, so we need to deal with MAJA now. Fortunately the bridge being out doesn't limit our travel back to the east side by way of the small town and forest. And now the pet store is open -- celebrating its 9th anniversity [sic], as apparently this town requires all new businesses to open on the same day every couple of years. We can get a free cat here. But if we just put it in the enlarging machine, it runs away. And the pet store doesn't have any more; it seems we ought to have put the saucer of milk down first. Now (after a restore) we see the GIANT CAT as he crashes through the laboratory wall and runs off. Hmmmm. I felt like we must be missing something, so I looked at the code one last time -- apparently we can actually witness MAJA using the lab to enlarge the other three mice we saw dangling from his mouth earlier, but we have to be in the right place at the right time, and this isn't strictly necessary. It does establish that MAJA is the mastermind, however, likely the original enlarged mouse. I enjoyed The Mouse That Ate Chicago, but as has been my experience with a number of the SoftSide adventures I had to dig into the BASIC code to figure out what I was missing; I wasn't stuck by specific puzzles so much as being unsure about what to do next and suspecting I had missed an important detail. My walkthrough is below the fold and is also available at the CASA Solution Archive. 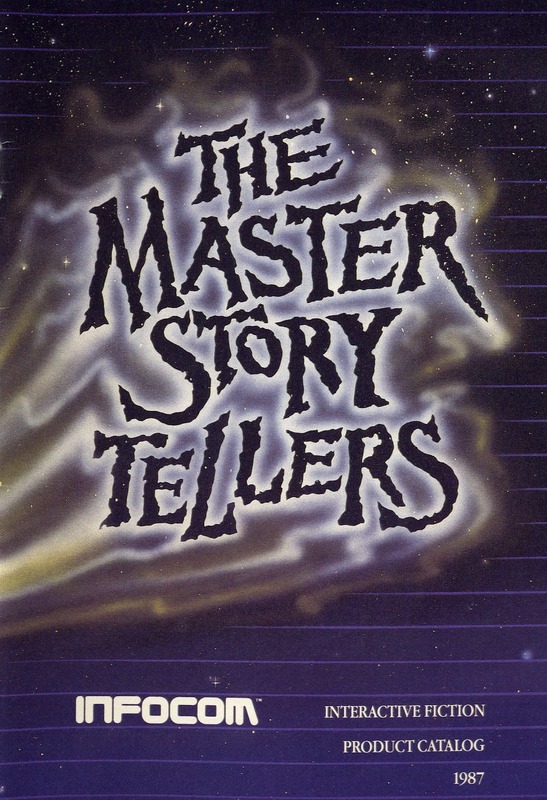 Continuing our leisurely stroll through the pages of premier interactive fiction publisher Infocom's 1987 product catalog, we come upon a spinoff from a popular trilogy, and an experimental work that isn't as well-remembered as it probably ought to be. 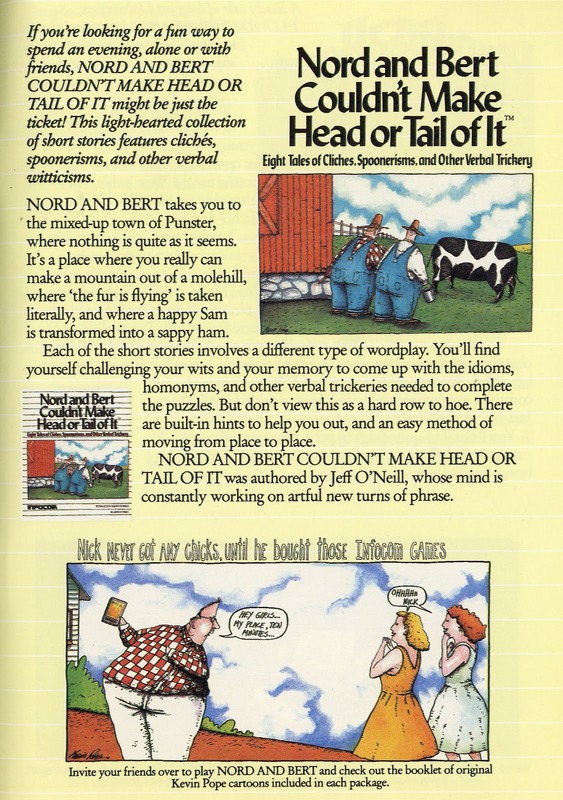 Brian Moriarty created Infocom's Wishbringer and Lucasarts' Loom, as well as some lesser-known type-in text adventures for magazines early in his career, but I had forgotten that he created Beyond Zork. 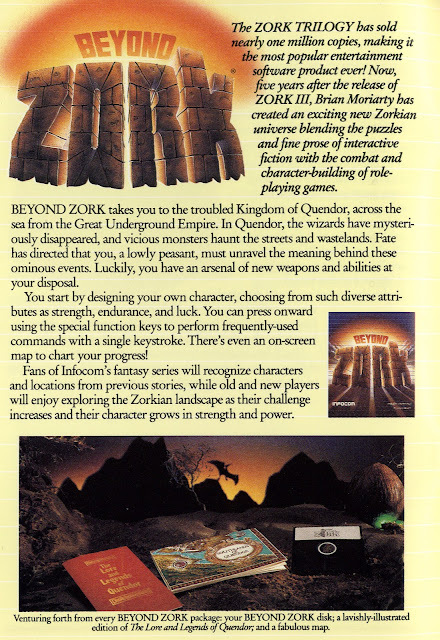 I haven't played it, but the ad copy here indicates it was an attempt to incorporate role-playing gameplay into the Infocom style (there were some random combat elements in the original ZORK trilogy, but this one aims more explicitly for stat-building, combat and dungeon exploration.) 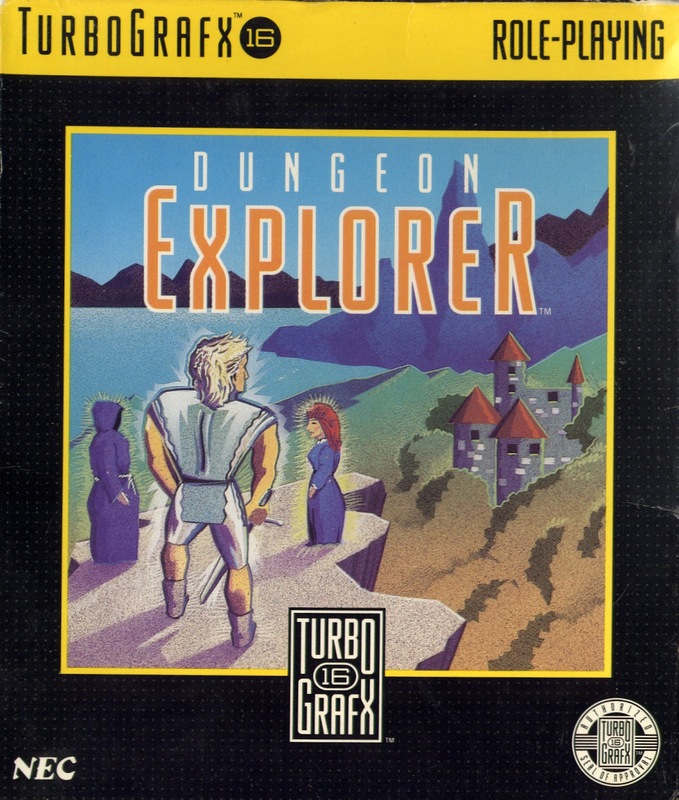 This may have been the first Infocom title to incorporate graphics of any kind, with an onscreen map. On page 6 we find the experimental Nord and Bert Couldn't Make Head or Tail of It, a series of short interactive puzzles -- ostensibly stories, but focused primarily on wordplay and puns. I haven't played this one either, but it's on my list and sounds like it's intended to be a quick, friendly, and funny, experience for word game enthusiasts. 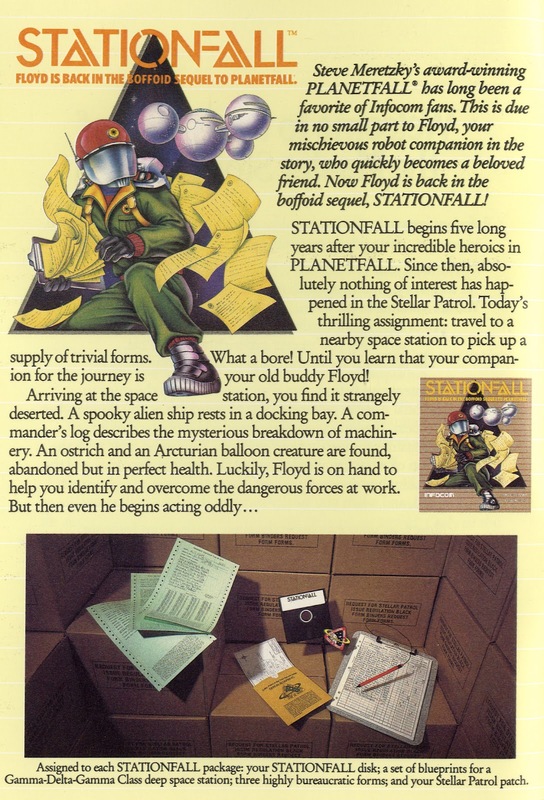 Unlike the more substantial Infocom titles, this one didn't come with any physical "feelies" as supplementary materials, but cartoonist Kevin Pope was engaged to provide a booklet of cartoons for added entertainment. Back in the late 1980s, when coin-op arcades still mattered, one of the PC Engine console's major claims to fame was its ability to render arcade-quality games the Nintendo Famicom struggled to cope with. 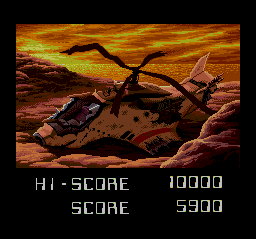 The American TurboGrafx-16 failed to capitalize on this advantage, in part because it came out here a few years after its Japanese debut, but a lot of the console's action titles were arguably coin-op quality with solid music, plenty of fast-paced action and minimal sprite flicker. 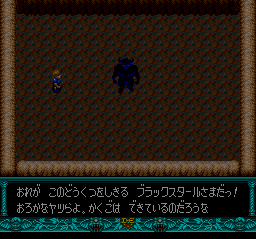 Avenger was never released in the US, but it's easy enough to play the original version -- only the level descriptions and voiceovers are in Japanese (Avenuja! ), and it's easy enough to figure out what's going on without speaking a word of the language. 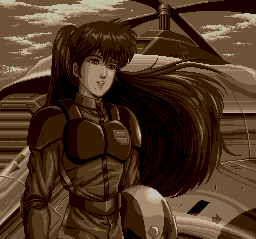 Publisher Sin-Nihon Lasersoft/Telenet is probably best known for the Valis series, but the company's development teams were capable of delivering a more than adequate arcade shoot-'em-up when called upon. 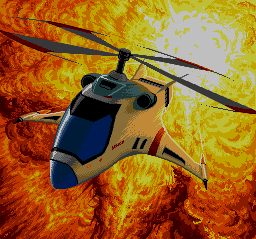 Avenger pits a well-armored helicopter against an onslaught of enemy planes, copters, boats, and spacecraft; it was published in 1990 for the first-generation PC Engine CD-ROM format, with Redbook audio music. The title screen theme features cheesy synthesized brass and drum machines, calling the Valis CD soundtracks instantly to mind. And the helmet comes off... and ZOMG! It's a GIRL! 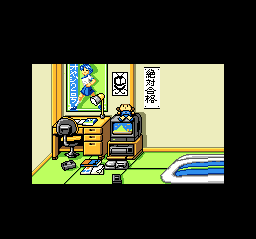 Well, it was cool when Nintendo did it a few years earlier in Metroid. 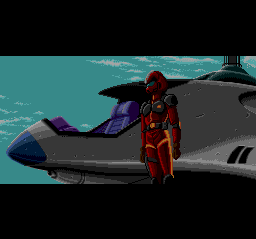 The animation tips the game's hand a little too much -- we're given only the briefest shot of the pilot's face in closeup at the start of the game, but when she finally steps out of the copter, the androgynous full-body shot before she takes her helmet off seems a little too deliberate. 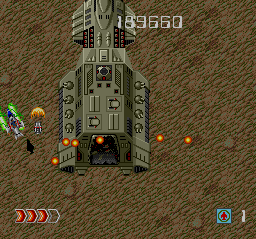 Still, it's good to see a tough-as-nails shmup starring a female protagonist, at a time when the game industry seemed to be all about the laser-firing codpieces. 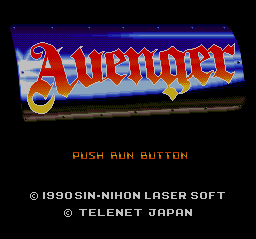 Avenger is another of those games that NEC could have brought to the US -- the company localized several other Nihon Telenet titles -- but chose not to. 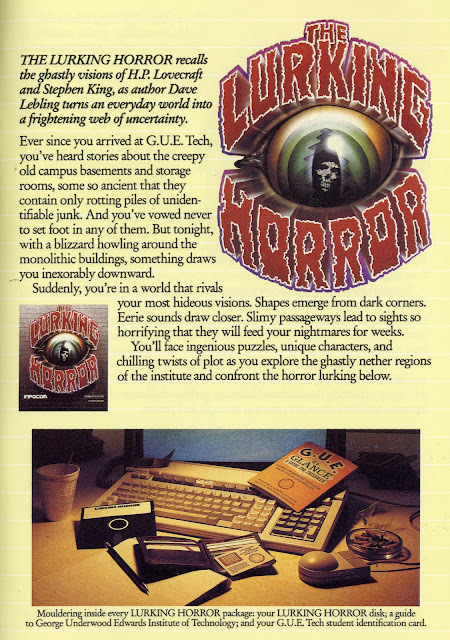 This may have been because it's a fairly difficult game -- Blazing Lazers was no doubt a better choice for mainstream marketing -- and the CD-ROM peripheral was not a huge hit in North America. But it's a solid title, much better than I expected, and very reminiscent of the Capcom and Romstar arcade shooters of the time. Good stuff. This one seems to have flown under the collecting radar -- if you can find a copy for sale, it can usually be picked up fairly inexpensively. Check here if you're in the market. WiiWare -- One new title this week: 2 Fast 4 Gnomz, a fast-paced cartoon platformer where the player utilizes several gnomes with different abilities. Judging from the trailer, this is no Lost Vikings; the game's sheer speed appears to present more of a memorization/reflex challenge. 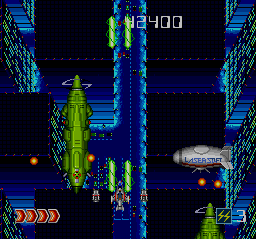 Wii Virtual Console -- Quiet again, its long silence only briefly broken by last week's release of Strider. DSiWare -- Oh, boy! It's Sokoban BoxyBoy Box Pusher, perhaps the most generically-titled entry yet in this long-popular, often frustrating puzzle game genre. This DSi/3DS game uses one screen for actual gameplay, while the other presents an overhead, 3-D view of the exciting proceedings as the player's avatar pushes boxes into a variety of often-irreversible configurations, in an attempt to reach something of value hidden behind a bunch of awkwardly placed boxes. 3DS eShop -- One new game, Dillon's Rolling Western, pitting a rolling armadillo sheriff against a variety of bizarre Western creatures, with an interesting mix of tower-defense and direct assault. There's also a free demo of the upcoming 3DS retail title nintendogs + cats -- everything's better with cats! XBox Live Arcade -- A downloadable House Party followup to a very solid XBox 360 game arrives: Alan Wake's American Nightmare. Officially, it's not a sequel to the original -- just another story set in the horror-soaked Alan Wake universe. Not much of a party game, really -- wandering through creepy, dark woods and caverns fighting off deadly enemies who fortunately suffer from crippling light sensitivity -- but that's the promotion du jour. PS3 on PSN -- No new titles this week, but Sony's a bit preoccupied with the PSP Vita launch. Vita on PSN -- Honestly, I'm still debating whether to cover the Vita in detail here; it's going to be confusing, as Sony is focusing heavily on downloadable games, some of which are also being made available at retail. But I will note that Plants vs. Zombies is new on the downloadable Vita store, and a good fit for portable play. 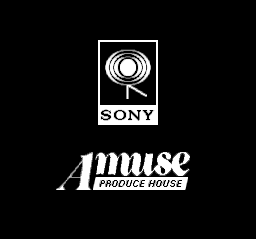 PSOne Classics -- Quiet here as well. Notable on Steam -- Not a lot this week, but given the XBLA schedule, I should note that the original Alan Wake made its PC debut this week, followed days later by a round of sorely-needed patches. Hopefully it's stabilizing now. UK gamer CooChewGames has posted the first part of a documentary series called Adventuring through the ages - Part I at YouTube. Inspired by a noticeable gap in last year's Get Lamp documentary, it explores the other genres that grew out of the traditional text adventure. It's nearly 20 minutes long, and well worth checking out. My only exposure to most of the animated Sinclair Spectrum games featured has been through screenshots in Retro Gamer magazine, so just seeing some of these titles in motion for the first time is a treat. And US gamers like me should enjoy seeing the UK perspective -- we shared a lot of developments as the technology moved forward, but as only the Sinclair ZX81 made it here and not the more powerful Speccy, there's a whole class of games we never saw in the US. I've enjoyed discovering the system's library in recent years, the Artic Adventures in particular. This week, we return to the collection of adventure games published by SoftSide Publications' monthly disk magazine, with SoftSide Adventure #14 - Robin Hood Adventure, published in July of 1982. Like most of the SoftSide games, the author is not credited onscreen or in the code, but the style of this game is a bit unique, coupling traditional adventure game puzzles with some random, RPG-style events. Thou art somewhere in Sherwood Forest...Thus it begins. Take up thy bow and arrow, and gather thy merry men, for thou art Robin Hood. There are rich merchants to rob and great deeds to do. But have care, bold Robin! The sheriff of Nottingham longs to see thy neck in a noose. Thou wilt surely need all thy wit and cunning to succeed. As it turns out, we will need more than wit and cunning. We will need a considerable amount of luck and/or patience, given the number of critical but random events in this game. And, at least if the version I found online is any indication, we will also need to dust off our BASIC coding skills to fix a bug in line 699. As tokenized, the code on line 699 reads, nonsensically, CONT X5=4 AND A=32 AND SC=1... and the keyword CONT should actually be IF. If we don't do this, the DROP verb does not work, and some very troublesome (and game-breaking) weirdness ensues in its place. THOU ART SOMEWHERE IN SHERWOOD FOREST as the game begins, and it's rather odd how Rob i'th' Hood doesn't seem to know his way around Sherwood very well. There are trees everywhere, and the map favors navigation in the four cardinal directions with the occasional diagonal move, but it's difficult to map as there are few landmarks, and we can't create our own as the DROP verb does not seem to work at all (we'll get back to that later.) We can climb a tree and spot some flying geese, but LOOK GEESE reveals only that Thou seest nothing special; we have to act silly and try to GET GEESE to confirm that they Art yonder in sky, O none-so-wise Robin. The command INVENTORY does not work but I does; these SoftSide games are not very consistent on this front. We begin with a fairly full set of equipment -- a green suit, a bow, a sword, 3 arrows, and 0 bags of gold. 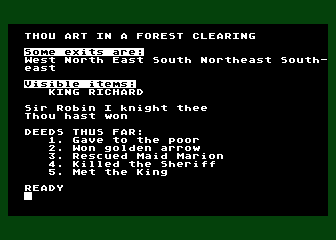 The inventory also tracks Robin Hood's DEEDS THUS FAR:, currently None; clearly there's going to be a little bit of RPG flavor to this adventure, which should make for a nice change from the usual treasure hunt or escape plot. Litter thou not. Keep thy weapons. I guess Robin Hood has to stay in character. We can use his bow to SHOOT GEESE (they are also visible from the ground) to end up with a DEAD GOOSE, but that doesn't accomplish anything just yet. So it's time to do some mapping, or at least try to. As we wander around the featureless forest, eventually we hear hoofbeats -- we can climb a tree and listen as the well-executed Atari hoofbeat sound effects grow louder as they draw nearer, turn by turn. Eventually there appears a RICH MERCHANT BELOW THEE -- but I couldn't initially figure out how to rob him. I try to DROP GOOSE -- and suddenly Sheriff says, "entry fee be 10 bags of gold". I didn't know there was a contest afoot, or that the Sheriff was here. Trying to DROP anything seems to produce this bizarre response, but I don't yet have a clue why this is happening. Meanwhile, here comes another RICH MERCHANT. We can't SHOOT MERCHANT or JUMP MERCHANT or ROB MERCHANT. If we try to KILL MERCHANT we are asked, Fight or shoot? FIGHT MERCHANT yields Missed... consistently. If we pause to LOOK at the room again, the merchant has moved on. We actually want to LOOK MERCHANT -- His horse is nervous. He be carrying: 2 bags of gold (the number of bags he be carrying be randomly varying.) If we try to GET GOLD, then Merchant laugheth at thee and rideth off. If we try to STEAL GOLD, without looking at him first, the parser tells us to Make sure he be carrying gold first, in a brief lapse into piratese. Then we can successfully STEAL BAGS or STEAL GOLD; After thou stealest, merchant fleeth. But this works only once, it seems -- after this, the next Merchant seeth thee and fleeth. So we have to rob the next one from the trees, apparently reaching down to steal his gold; after that we can rob at ground level again, indefinitely. And there's no apparent limit to how many bags of gold we can steal, the authorities don't seem to care. With 10 bags of gold stolen, we can try again to DROP GOOSE, yielding something even stranger: Sheriff taketh 10 bags of gold for entry free. I know not what you mean! And suddenly we find ourselves in the middle of an archery contest. The scoring of the other competing archers is tediously laid out onscreen. A miss yields zero points, while we get 25 points for hitting the middle ring, 35 for the inner ring, and 50 for a bullseye. This is all completely random; despite Robin Hood's fabled archery skills, he can readily come a cropper here. In my first try, Robin's first attempt yields 35 points in the inner ring; in round 2, all the other archers miss, and Robin earns 25 in the middle ring. And... we can't make it to Round 3, because I used up an arrow shooting at the geese earlier. Following our embarrassing lack of preparation, we find ourselves in Nottingham, where Thou hearest beautiful singing and normal adventuring seems about to happen. But an un-Sherwoodian alarm klaxon starts ringing, as we learn that Thou hast been recognized. Thou art dead. This adventure is over. So clearly we need to be doing this differently. Wandering through the obstinately unmappable wilderness, we discover that on occasion one of Robin's Merry Men shows up, like Will Scarlet. Will is ready to follow, which implies we will be rounding up some others. More random wandering discovers the location of Friar Tuck, who says, "Robin, I'll not follow thee yet", so he must want something. There's a LONG WOODEN POLE in one location, but it's not clear what we should do with it. Trying to DROP POLE puts us back in the archery match, where we can confirm that the scoring is random. Sherwood Forest is apparently mappable, but it's really hard to do with no ability to drop items. There's a paper tacked to a tree in one room; it reads, "SHOOTING CONTEST TODAY IN NOTTINGHAM - Signed: THE SHERIFF". So that must be where we magically arrive whenever we try to drop something. To the east of this paper, we find a stream, and we Art crossing log in water. GO STREAM yields Water is B-R-R-R. LOOK LOG yields Little John. Huh? LOOK JOHN -- He laughest at thee. Uppity log. Ah - we can GO LOG to see Little John standing there with a long pole, and calling, "Wilt thou joust, Robin?" We can JOUST with the long wooden pole to end up in the water, but after we emerge, Little John says, "Robin, thou art good sport. I will join thee." These Merry Men are very good-natured indeed. Little John does, however, carry a bug -- after LITTLE JOHN joins the band, FRIAR TUCK no longer shows up as a visible item in his location. We only know he's there because we're still told he's sitting there, smacking his lips and continuing to say "Robin, I'll not follow thee yet." There's also a WINDING ROAD in the forest, but GO ROAD reveals only that it Is far to walk. We can also STEAL HORSE from one of the merchants -- the animal is never mentioned as a visible item, but the hoofbeats and lack of telltale coconuts kind of give it away. But Will Scarlet takes it, and after that we can't steal any more horses. There are some pasture areas, one of which contains a large jagged boulder; we can PUSH BOULDER if we have the long wooden pole, and find a golden harp. But we can't PLAY HARP. If we DROP something again and actually manage to win the archery contest -- after multiple tries and keeping all three arrows early on -- we win a prize. But then Thy cap fallest off, O clumsy Robin. Thou hast been captured, and we never find out what it is! Ah - we can STEAL CLOTHES from a merchant, which become a DISGUISE. When we GET DISGUISE, Robin puts it on and drops his traditional green suit. And then, having abandoned the official highwayman's uniform, he can't rob merchants anymore; they just laugh and ride off. 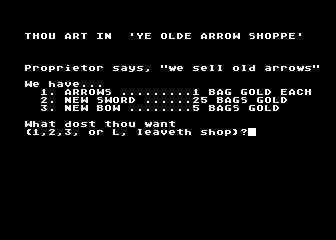 It is at this point that I began to find Robin Hood Adventure's sheer randomness truly irritating, along with the need to raise quite a few bags of gold by mugging an infinite stream of careless merchants. Back to the game -- after we lose the archery contest, or win, in disguise, we can navigate around Nottingham. A lawn has some targets on it, but right now we can't SHOOT TARGETS, as Robin, thy quiver is empty. The display also notes that there is No contest today. The other lawn has a scaffold with (gulp) a rope, but we can't GO SCAFFOLD, CLIMB SCAFFOLD, GET ROPE or STEAL ROPE, so we apparently won't be needing that. And still Thou hearest beautiful singing, but where is it coming from? While there are no obvious exits going west or north from our location in front of the castle, we can still go W to a lawn where A feast fit for a king is served and Friar Tuck is enjoying the chicken barbeque. We can enter the castle to the North, and explore the Grande Hall. A locked door is on the staircase -- oddly, we can still see the FLYING GEESE from inside the castle if we haven't yet dispatched them. South of the shop, we find what appears to be the other end of the winding road leading out of Sherwood. And it seems that we can't return to Sherwood Forest without a horse? Dangeth it! So we need to take a horse with us. And this whole warping-to-the-archery-green business still seems weird. So it's time to dig into the ancient BASIC code and discover why the DROP verb isn't doing what one would expect; the bug in line 699 is the culprit. With CONT changed to IF, the DROP bug is fixed, and we can no longer exploit that defect to jump straight into the archery contest. But it allows us to play the game the way the designer intended. Now we can SHOOT GOOSE and GIVE GOOSE to FRIAR TUCK to get him to follow us. After we joust with Little John, we can travel further W from the log to find Allan A Dale (I'll assume he's the same as Robin Hood's Alan-a-Dale and this is not just a relative or something.) He also wants something, and it's his singing we've been hearing; we have to GIVE HARP to get him onboard. Once we have all the Merry Men assembled, their merriment breaks down considerably and they all start complaining: "Robin, I've got no horse." We hear this over and over again -- each Merry Man deprived of a mount will say this every turn, so we're strongly motivated to round up some horses. We're not allowed to steal any more horses from the merchants -- Will already has his -- so we have to find a Brown Mare in the northeast pasture for Little John; Friar Tuck and Allan A Dale will ride together on the Black Stallion found grazing in the southeast pasture. But Robin himself still can't leave the forest. We can find a cottage in the western forest where POOR OLD WIDOW BROWN lives, and we can GIVE GOLD to earn deed #1, "Gave to the poor." This act of generosity is a little too generous, perhaps, as it gives her all of our gold, so we're better off doing this early before we've done too much merchant-sacking. Near her cottage, at least, we find a SILVER HORSE, after all the men are assembled, for Robin Hood himself to ride. That is, if we can figure out how to do that -- we can't RIDE HORSE or MOUNT HORSE or GET HORSE (Thou art weakling) but we can GO HORSE. The horse has no problem crossing the log over the stream, fortunately, and now we can make our way to Nottingham by road, as the author clearly intended. Now we need to stop in the shop and buy an arrow to replace the one we used on the goose. The horse can't go into the shop, but we can't GET DOWN or GET OFF or DISMOUNT either -- we have to DROP HORSE; you know, the one we couldn't GET earlier. At last we can go to the field where the targets are to enter the archery contest properly -- now our fellow contestants have names, and the rules are stated up front. This is all much more sensible than before the DROP bug was fixed, but it's still random -- it's wise to save and retry rather than running off to raise more gold and buy more arrows. When at last we've won the contest, Robin's cap falls off and we're captured, even though we were in disguise, and we find shortly that Thou art being hanged. Ye noose is upon thy neck. But our faithful Merry Men shoot the rope with an arrow, and our horse runs under us, and Thou dot [sic] gallop back in yonder Sherwood Forest. Now we can kill the second guard, and find a key on his body, and open the tower door and rescue Maid Marion (well, we can GET MARION, at least.) Now the villainous SHERIFF OF NOTTINGHAM reappears, and patiently follows us around as long as we like until Robin feels ready to dispatch him. We can't FIGHT SHERIFF -- Missed... -- but we can SHOOT SHERIFF (though not the deputy). Here's something REALLY annoying, however -- the shop only has one extra bow in stock, so if we break it a second time on the second guard... we need to restore and backtrack quite a distance. Ack! After we SHOOT SHERIFF, we have 4 major deeds accomplished. But the game doesn't end yet? We can wander around for quite a while, looking for some daring deed or puzzle that might provide closure. We can't wake the unconscious guard. Delivering Maid Marion to various places and putting Robin's old GREEN SUIT back on doesn't seem to cause any reaction from the people of Nottingham. 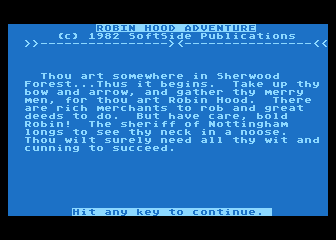 Robin Hood Adventure is another one of those early games whose interface accounts for most of the challenge and aggravation -- that furshlugginer DROP bug made the early going a real non-treat. Once I had that little meta-game solved, I was able to piece the narrative together in a more sensible manner. But even so, there aren't many clues as to what we're supposed to do -- we just have to find things to try and hope some of them count toward victory. I always enjoy the SoftSide adventures, but if they weren't written in easily-hackable BASIC, I'd probably have to give up on most of them. My walkthrough, below the fold, should save you some of the headaches, though it can't avoid the long rounds of repetitive waiting and robbing that the game's design requires. It should also be available soon at the CASA Solution Archive. 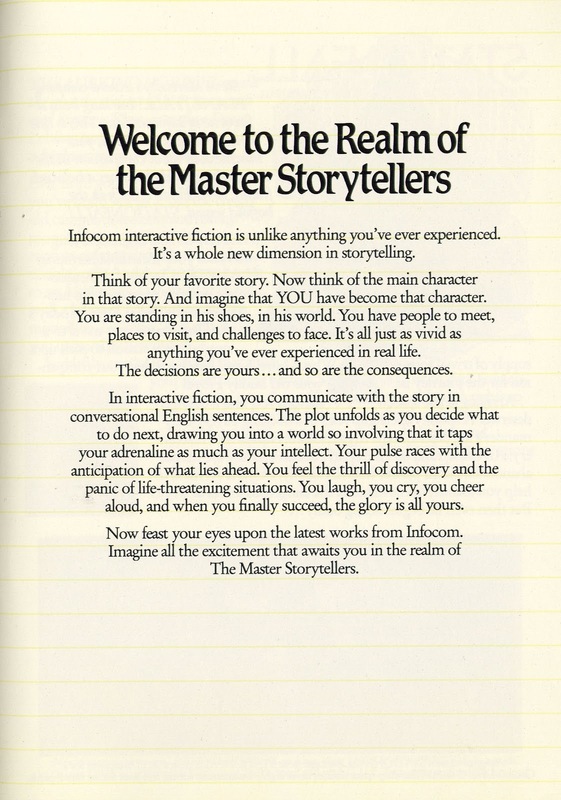 We're paging through the 1987 Infocom product catalog, and pages 3 and 4 start to get into the meat of the matter, pushing a couple of then-new works of interactive fiction. 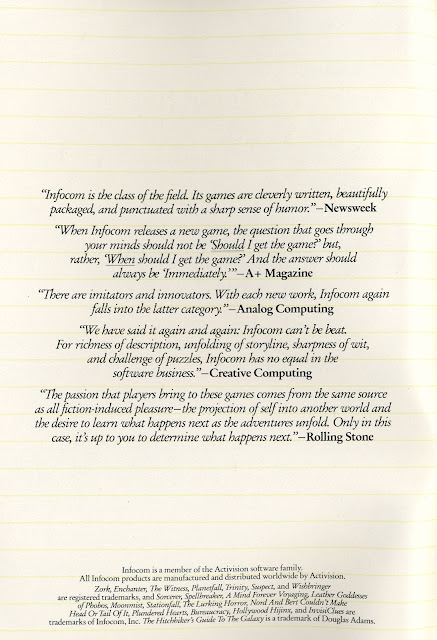 I'm not going to comment too much on these pages, as they're pretty text-heavy already and Infocom's ad copy speaks for itself. But given the stripped-down releases that came along a few years later under Activision's cost-cutting regime, it's nice to see the classic Infocom packaging featured, complete with a list of the memorable pack-in "feelies" for each title. Page 4 features Infocom's one and only assay into true horror fiction, The Lurking Horror. I've written at length about this one already, but seeing it in historical context reminds me that the layout of the G.U.E. Tech campus always made me think of Michigan Technological University, where I was studying Computer Science and Classical Literature at the time this game came out. It's not a close resemblance by any means -- I believe the map was actually based on M.I.T. -- but in the "theatre of the mind" that makes interactive fiction so effective, I always pictured the Computer Lab and the snowy courtyard in Houghton, Michigan terms. Next weekend, we'll continue the journey. 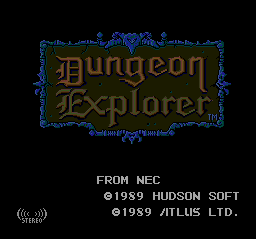 Dungeon Explorer was an action RPG created by Atlus and published by Hudson Soft in Japan and NEC in America, both in 1989. 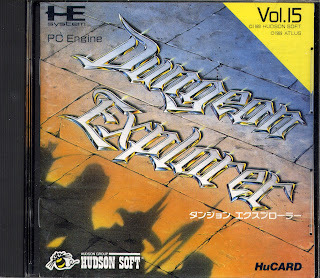 It was Hudson's 15th PC Engine HuCard title released in Japan, and was one of the launch titles for the American TurboGrafx-16 later that same year. What's happened to the magician's head? Is it shrinking away to nothing while his or her lower half is overtaken by unsightly swelling? Why is the barbarian in the foreground poking his blunt-tipped sword backward between his shins, and why does his shadow suggest that something else entirely is dangling down? And what's he doing with his left hand? Why is the entire affair so carefully shaded and airbrushed while ignoring basic principles of human anatomy? It remains a mystery why NEC's North American marketers opted to replace this perfectly serviceable image -- already in English, mind you! -- with the poor-man's-Gary-Panter image on the American box. 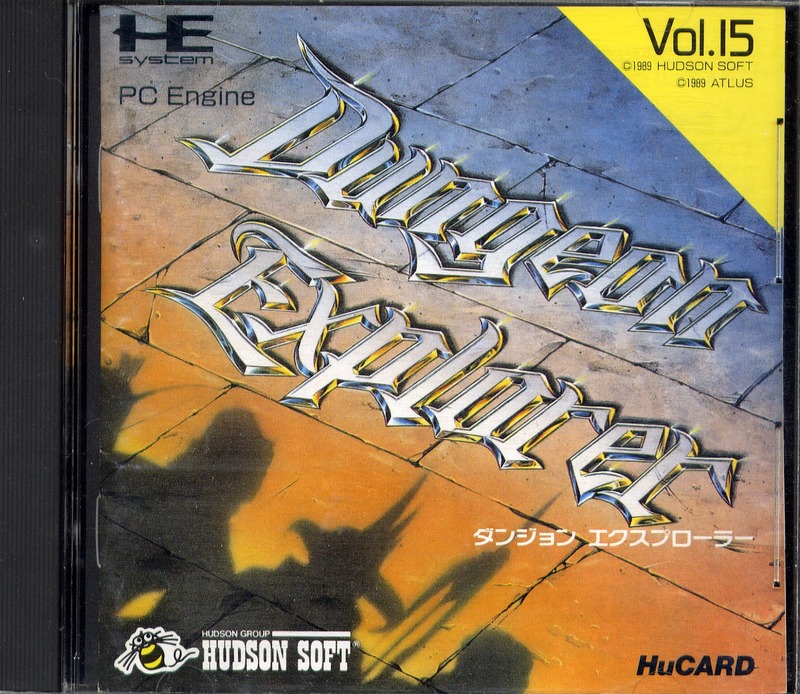 But NEC made a lot of strange decisions when it came to marketing the Japanese PC Engine to Western audiences, and that's why I put these East vs. West posts together once in a while. 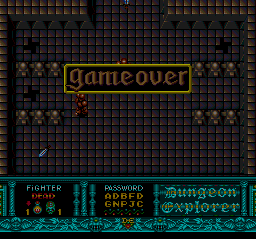 The influence of Atari's coin-op is obvious -- there are monster generators to take out, multiplayer support is a major feature, we attack by shooting our weapons, and when a character reaches the stairs to a lower level of the dungeon, he or she spins merrily down the drain. Of course, since all 5 players have to operate on one screen, they'd better agree about which way they're going, or everyone will just be stuck in place. Once we select a character class, the action is underway. The monsters respawn, and unlike most RPGs, friendly characters with whom we can converse are often found living or standing around near monster generators. After the battle, we find our way back out of the dungeon, passing through the same floors we came through on the way in, but generally passing through different, treasure-rich areas. When we get back up to ground level, we can explore the world some more, meeting new people and learning of new monsters awaiting death at our hands. WiiWare -- No new games this week, but you can augment your Netflix channel with the new Hulu Plus service for more streaming video entertainment. Wii Virtual Console -- Wait, what? After months of nothing new here, SEGA steps up to the plate with the Mega Drive version of a classic action-packed arcade game -- Strider! DSiWare -- One new game this week -- iSpot Japan, a spot-the-differences casual game with some pleasant scenery and authentic Japanese voiceovers. 3DS eShop -- It appears that Virtual Console library overlap is a non-issue in Nintendo's eyes, as the original Super Mario Bros. now turns up in emulated form on the 3DS VC. No 3-D effects or other updates here, just old-fashioned NES goodness. There's also a free downloadable demo of the upcoming METAL GEAR SOLID: Snake Eater 3D. XBox Live Arcade -- Just one new title this week, kicking off the XBLA House Party festival of substantial downloadable games with Warp, an escape-the-Earth-laboratory action/puzzle game starring a cute little alien whose cloning/time-warping/body-exploding antics ought to put the fading spectre of Atari's E.T. to rest at last. PS3 on PSN -- One new game here: Team 17's Worms: Ultimate Mayhem, bringing more humorous worm-based weapon-heavy violent cartoon fun to the PS3, with support for local and online multiplayer. PSOne Classics -- Nothing new here. But I expect that will change shortly. I like to think my gaming tastes are fairly eclectic, but there are a handful of genres that have never really appealed to me. Gambling simulations are probably at the top of that list. It's not so much the chance elements I dislike -- variety is the price of life -- but the fact there's no gameworthy way to respond to them; either the wheel spins your way or it doesn't, and the only decision left is whether to walk away or put more virtual money on the table. 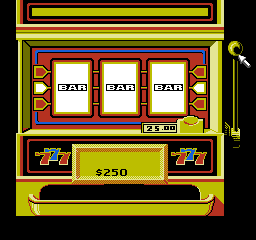 Plus, my Dad has a tendency to sarcastically ask whether money comes out of the machine when you win -- referring to proper video games -- and this is one case where that feature might actually provide a valid reason to play; there's certainly little real-world satisfaction to be had from hitting the random number generator spot-on and racking up the digital bucks. 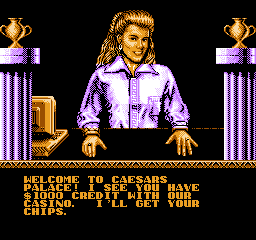 So I wasn't tremendously excited when a blind reach into my unplayed game pile came up with a loose copy of Virgin Interactive's Caesar's Palace for the 8-bit Nintendo Entertainment System. (I picked this one up in a thrift store bag with a bunch of Game Boy cartridges I was actually interested in, if you're wondering.) But it's a game I haven't played or written about, so here we go! Upon entering the casino, we are greeted by the same Vanna White impersonator who graces the box art. She apparently doesn't see very well, as she offers $1000 in existing credit to anyone who stumbles in off the street. I wonder whose money we're actually playing with? The cashier's image is actually interesting from a technical standpoint. The NES relied heavily on tiled graphics, and the same efficiency techniques that made Super Mario Bros. feasible had to be applied to any picture shown onscreen. If you look carefully at our hostess's white blouse, you can see odd bits of repetition and sharp borders where there just weren't enough source tiles to go around, and the enterprising artist had to carefully make do with duplicate blocks. 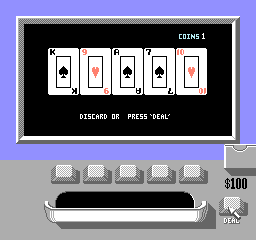 At least there's a decent round of blackjack on offer-- a game that allows for a modicum of skill, or at least allows the player to consider the odds before making a decision. But like all of the games featured in Caesar's Palace game, it's oddly impersonal -- there are no rival players, dealers, stoned hangers-on or shopworn prostitutes around, and we seem to have the casino entirely to ourselves. It's enough to make one miss the shifty-eyed little dealer character from the old Intellivision Las Vegas Blackjack cartridge. Here's more of that spacious 256K cartridge put to use -- when we finally get bored and cash in our chips, there's nothing left to do but go home. 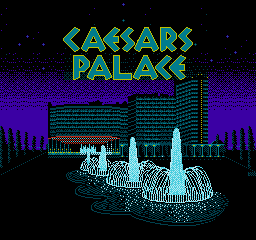 Remember, everyone, Caesar's Palace is in Las Vegas! Caesar's Palace does exactly what it claims to do, and I'm sure many players spent a lot of happy hours at its virtual casino. 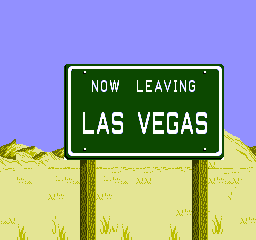 But there's not really much of a game here, and I was happy to be on the virtual bus heading out of town. Thanks for the chips, Vanna! 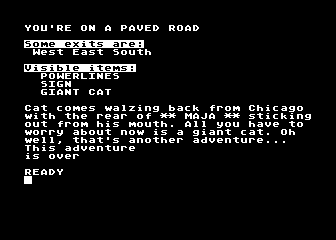 It's back to early adventure game territory this week, with Spider Mountain, a treasure-hunt text adventure game for the TRS-80 Model I/III computers, published way back in 1979 by The Programmer's Guild. This is officially Rider Fantasy Creations Adventure #2, written by Programmer's Guild founder Bob Liddil and "Teri Li" (actually Terry Kepner, who was contracted to another company at the time and programmed under a pseudonym here.) 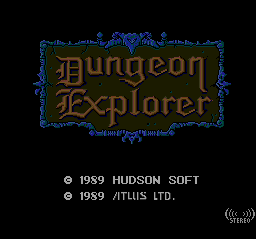 Kepner/Li also wrote the earlier The Lost Dutchman's Gold adventure, which was identified as RFC Adventure #1, and this game also exists as a Commodore 64 port. 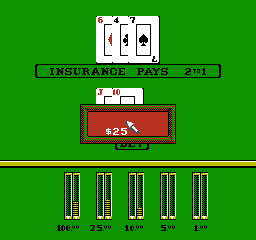 The parser is case-sensitive, but released at a time when TRS-80 lowercase kits were uncommon, so the game needs the caps lock on under modern emulation; it generally requires full object names including adjectives and punctuation, and does not support abbreviations like I and N -- we have to type INV or INVENTORY, and GO NORTH. As in The Lost Dutchman's Gold, this game is in theory "hosted" by an external entity, YOUR PSYCHIC 6TH SENSE, WISDOM in this case, but this idea doesn't play into the story at all. We're not given much information about the storyline, just a simple GOOD LUCK, SIR KNIGHT, ON YOUR SPIDER MOUNTAIN QUEST to send us on our way. We begin at our small campsite, where we see some carrysacks, an untied burdenbeast, and a campfire. Clearly there's a fantasy motif afoot here, and the game adopts some unusual object names in an effort to distance its universe from the real world. LOOK BEAST yields nothing interesting, and look beast even less due to the parser's case-sensitivity, but LOOK BURDENBEAST reveals the creature as a FLOP-EARED ILL TEMPERED QUADRAPED [sic]. It's very like a mule, in other words; this is starting out a lot like Lost Dutchman's Gold. Examining the campfire reveals a LEATHER PIECE -- we can't GET PIECE, but LOOK LEATHER indicates that IT SMELLS OF CHAOS, AND APPEARS TO BE MADE OF HUMAN SKIN. THERE ARE SOME RUNES WRITTEN UPON IT. Creepy! READ LEATHER reveals, "THERE'S SOMETHING MAGIC ABOUT HOME." But SAY HOME doesn't immediately appear to do anything, so maybe the magic is more subtle than that. We have to GET CARRYSACKS before we can LOOK CARRYSACKS to find that THEY CONTAIN HANDWEAPON. BEAST MUNCHIES. The deliberately non-standard nouns will start to become tiresome by the end of the game -- for example, LOOK HANDWEAPON indicates that IT'S A MULTI-SHOT SPRING LOADED DART SHOOTER, WITH 2 DARTS. So why not just call it a dart gun? I guess we can be grateful it's not identified as a MANY-LAUNCH COILMETAL POINTFLINGER WITH 2 FLINGPOINTS, anyway. We can't actually navigate out of the campsite via any of the "obvious exits", all of which just loop back to the camp... oh, no, that's not it, we have to GO NORTH, N doesn't cut it with the parser. LEAD BURDENBEAST yields TOUGH LUCK, YOU TRIPPED AND THE BURDENBEAST RAN OFF, but the animal doesn't actually leave the campsite. We have to GET BEAST (which refers to the beast munchies in the carrysacks) and FEED BURDENBEAST (which refers to the beast itself), yielding NOW, TRY TO RIDE/LOAD HIM. We can RIDE BURDENBEAST; no error or message is thrown for trying to DISMOUNT, but it seems we actually have to UNRIDE BURDENBEAST to get off. In the end, we learn that there's absolutely no reason to ride or load up the poor animal at all; we can get where we need to go on foot, the burdenbeast can't enter the parts of the map where most of the action takes place, and we can carry everything we need ourselves. We can tour the outback, travel a dirt road, and find an ABANDONED GRAYLOCK VILLAGE with a sign reading, "DANGER -ORC TERRITORY," and a tavern. The tavern contains ambrosia bottles, a piece of paper, broken glass, and some tables and chairs. One of the tables contains a torch, always handy for adventuring. LOOK AMBROSIA indicates something behind the bottles, which turns out to be a BOX OF ASSORTED QUARRELS AND DARTS after we take the bottles. We can opt to DRINK AMBROSIA, which yields WHEEEEE ! YOU GOT PLASTERED AND LOST A DAY, but this has no actual adverse consequences. The paper contains the traditional in-game ad -- the player is urged to WATCH FOR MORE R F C ADVENTURES! Getting the box of ammunition reveals a lever, and PULL LEVER in turn reveals a trap door. The trap door leads to a VERY, VERY LONG CORRIDOR -- and it sounds like there are orcs up ahead. We can't LOAD HANDWEAPON yet, as it only holds two shots at a time. And it's dark down the way, and we can't LIGHT TORCH yet. We need some means of ignition, but it's already too late -- we can't move or do much of anything else in the dark, so it's time to restore and avoid this neighborhood for the time being. 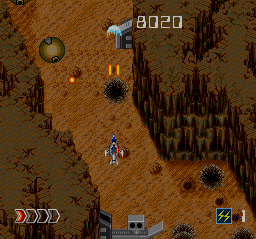 North of the village is the base of Spider Mountain. As we climb through Hell's Gate Pass, we find a ROUGH CLOTH BAG and BONES OF RECENT SPIDER VICTIM, so we'd best take the mountain's name literally. We have to LOOK ROUGH (that is, the rough cloth bag) to find that IT'S AN OLD TORN SACK, which isn't very helpful; but if we OPEN it, we find some matches. Good! Exploring the underground corridor with our trusty torch in hand leads to an intersection with paths leading in all four cardinal directions. The design's style often shows us things in the distance, and allows us to GO to them directly or navigate via compass directions; in many cases, both are valid, but not always, which can make things a little confusing on the mapping front. An open alcove north of the intersection has smooth marble walls and a dirt floor -- but we can't DIG yet. At the end of a narrow passageway to the south we find a LOCKED OAKEN DOOR, which will almost certainly require a key, and to the east is a staircase with dusty, worn steps, leading to a cavern containing a *SACK OF GOLD DUCATS*, a pool, and a boulder. We can enter the pool to find keys, cave moss and stalagtites [sic]/stalagmites; the only useful item is the set of keys. West of the cavern is a T-shaped intersection -- Spider Mountain has a fairly extensive map for a TRS-80 BASIC game -- that features some puzzling growth on the walls. EXAMINE LICHEN indicates ITS A MESSAGE!, but READ LICHEN produces only YOU CAN SEE NOTHING SPECIAL, and READ MESSAGE doesn't do anything interesting either. I think we have to chalk this one up as a design or testing oversight, from an era when most QA was done by the programmer. To the south of the T is an earthen barrier wall, but we can do nothing with it yet. Traveling back through a low crawlway, we see a NOTE that wasn't there before, telling us to BRING TREASURES TO TAVERN, AND SAY SCORE. Okay, it's good to have that traditional detail cleared up! The note seems to appear only if we have a treasure in hand -- we can free up inventory slots by PUTting things in the carrysacks, but may miss this important note if we do so. In a rare deviation from the parser's usual style, we can use the keys to UNLOCK DOOR rather than having to UNLOCK LOCKED OAKEN DOOR. It becomes an UNLOCKED OAKEN DOOR, but we have to GO OAKEN rather than GO UNLOCKED to enter the Ancient Crypt. Here there's a jewel-encrusted coffin, with one loose # JEWEL # visible if we examine it. But once we do this, the oaken door is sealed. PUSH STATUES doesn't help to open the door and make our escape, so it's another opportunity to restore and come back to this later. Especially because after messing around underground for a while, we eventually learn that YOU'RE [sic] TORCH IS BURNING LOW, and it burns out fairly soon, leaving us stuck helplessly in the dark again. Going back to the tavern with the treasures we've claimed so far, it seems that each one is worth 25%, so there must be four of them to claim. Returning to Spider Mountain, we enter a narrow and treacherous crevasse, leading to a gorge entrance blocked by boulders. Fortunately there's a DIGTOOL here -- not a shovel, mind you. 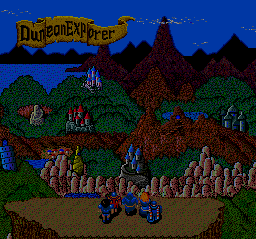 To the east, hiding behind some brush, we can spot some ORCS and a WEAPON, which is a single-shot crossbow, unloaded. If we examine the orcs, THEY ARE A SAVAGE LOOKING BAND. AND THEY'VE SEEN YOU. But we can simply SHOOT ORCS - WITH WHAT? - HANDWEAPON, hitting one of them between the eyes, and killing him, as the others run off. We can load the new weapon with a quarrel from the box; the dead orc possesses nothing of interest. With our digtool, we can return to the underground areas. Digging in the alcove's dirt floor yields nothing, but digging at the dirt wall south of the T-intersection, we find a # GOLD RING #. So now we have one treasure left to claim, and we probably do want the # JEWEL #; the use of # instead of * for punctuation doesn't seem to mean anything negative. So how are we to get in and out of the ancient crypt? Well, first we might have to deal with the band of hostile orcs now hanging out in the tavern; as it turns out, though, while they are eager to attack and kill us if we try to shoot them, we can just ignore them and go about our treasure huntery. So back to the crypt we go. As soon as we LOOK COFFIN and discover the jewel, the door seals, so it's probably not a matter of moving the coffin or appeasing the coffin's occupant. SAYing HOME with or without the scary leather piece in hand doesn't do anything interesting. We can BURN LEATHER in an attempt to invoke its magic, which produces a BURNT LEATHER PIECE -- interesting, but a closer look now tells us it's just BURNT UP AND RUINED, so that's probably not a good idea. AH! Examining the # GOLD RING # reveals that it is actually a RING OF TELEPORTATION; THE INSCRIPTION READS, "SAYING THE MAGIC WORD, GETS ONE HOME." Discovering the leather piece is, in fact, somewhat optional. As a means of assessing our skill, the game rates us based on our number of moves -- it took me 302 moves, a rating of SO-SO, on my playthrough. I took a look at the code -- I didn't have to do so while playing the game, for a nice change -- and saw that this is actually the worst rating, awarded to anything above 199 moves. I also realized that I never did run into the titular Spider who guards Spider Mountain, though the code contains a response of OH NO! YOU'VE BEEN ATTACKED BY SHELOB, GUARDIAN OF SPIDER MOUNTAIN. HER VENOM IS A POWERFUL NEUROTOXIN. YOU'RE DEAD; this apparently happens if we're in the wrong place without the right items in inventory, which didn't happen to me. This isn't a particularly difficult adventure; most of the puzzles are obvious, and there are enough clues provided to keep an observant player moving in the right direction. The game can indeed be finished in under 88 moves to earn an EXCELLENT rating; the CASA walkthrough by Rene van Hasselaar and friends does it very efficiently, well under the target. 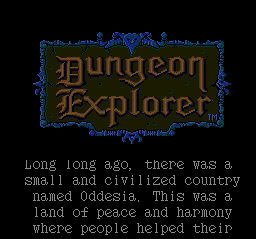 This was a fun, quick little fantasy adventure; I've now played most of the Programmer's Guild adventures published by the late Mr. Liddil, but there's at least one more I haven't tackled. A New Adventure Game from Tim Schafer? So it seems that Tim Schafer's Double Fine is considering producing a classic-style point-and-click adventure game. Because the genre has been commercially dead for a while, they've opted to start by raising pledges of $400,000 via Kickstarter -- and they're up to about $1.6 million already. Seems a lot of people would love to see something new from one of Lucasarts' adventure game greats, and Double Fine has established its own solid reputation as a purveyor of quirky, funny, and fun-to-play games. And this new downloadable gaming era makes distribution, duplication, and marketing costs much easier to deal with. No word yet on what the game will be, but it's looking like this just may happen. Seems there may be a bit of a point-and-click renaissance in the air. Woo-hoo! 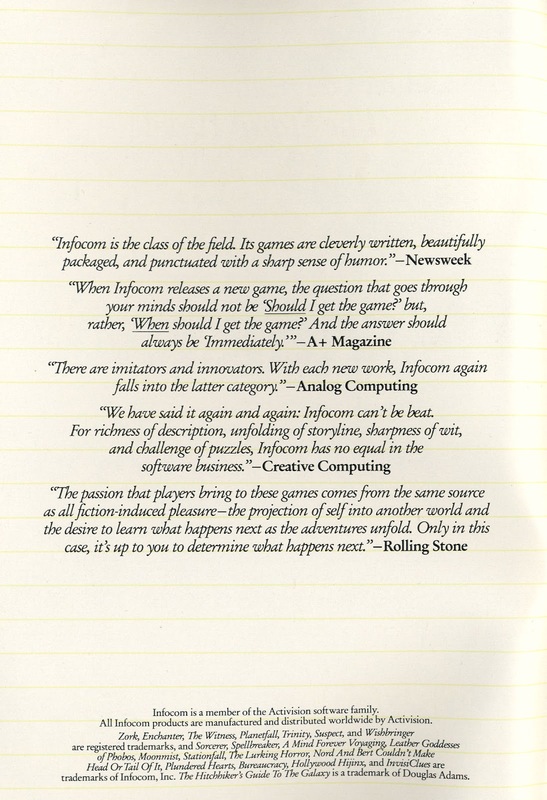 Time to start another cover-to-cover series, as we look at interactive fiction pioneer Infocom's 1987 Product Catalog. 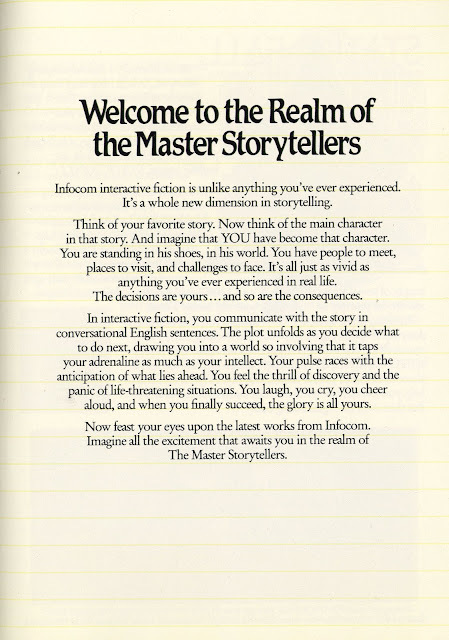 Infocom's classic text adventure games works of interactive fiction are still regarded as high-water marks for the technology; even as the art form has continued to advance into non-linear, postmodern storytelling in the hands of independent enthusiasts, most authors still rely on the portable, flexible, efficient Z-machine interpreter. With a suitably tempting introduction out of the way, next time we'll start looking at the pages promoting actual games. UPDATE: And we have a winner! Mobygames approver Rowan Lipkovits was the first to respond. Enjoy the game, Rowan! This is something I haven't tried before -- I'm not by any means promising this will be a regular feature, but I'm curious to see how this goes. Since this is an item of nominal value (but good entertainment just the same), this isn't as much a contest as a simple race. I will happily give this game to to the first reader who sends me his or her email address and/or Steam ID. You can find my email address on this blog's About Me page; please title your email SATURDAY GIVEAWAY 02/10/2012. Please let me know how you'd prefer to be identified when I announce the winner here, and if you already own the game or live in a part of the world where Steam is unavailable, please let someone else have a chance at it. Thanks! Gentle gamers, start your engines! And then... my trusty emulator gives up, hanging on a black screen that it never quite gets past. But I was able to run the game on authentic hardware to see what this is all about; my remaining thoughts will, however, not be illustrated. 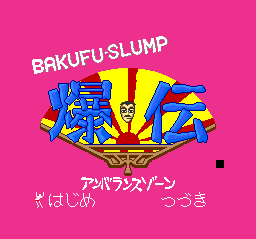 Bakuden Unbalance Zone is basically an adventure game, though it's similar in style to a digital comic. Our hero navigates a map -- though progression seems to be linear -- and enters a variety of "zones", each tossing him into a different hazardous situation. The interface is quite limited -- there's no inventory or dialogue system, but when we have control, we can choose from a set of five body part icons implying associated actions (not always predictably). 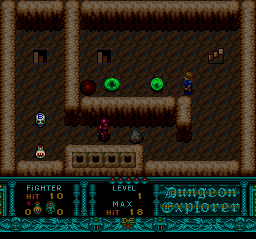 The player can also summon assistance, or at least commentary, from our four overseers above by selecting the question-mark icon, and sometimes this is actually the right solution to a given situation. If the chosen approach is successful, the story progresses; if not, the results play out with comical animation and no real consequences, as each sequence just resets to its initial state after failure. It's actually more entertaining to pick the wrong actions, most of which result in our hero's death or mortifying embarrassment, but it's all a bit random -- it's not really possible to predict which approach is the right one in most situations. 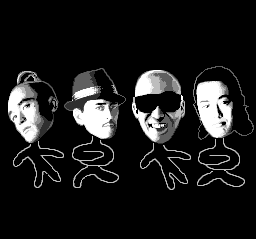 As the game begins, our otaku friend's videogame session is interrupted by a gang of four mentors/overseers/minor deities who come crashing through his bedroom wall. They mug and yell, and I'm sure if I understood Japanese I'd learn something about why the ensuing action takes place. But it's clear enough that our hero will have to undergo a dangerous quest, per the usual. The first zone of the story pits our man against an ill-tempered yellow cat, who chases him up a tree; the two then battle it out, generally by abusing each other in ways that would have made Bugs and Daffy blush. Rocks fall on heads, characters slam into the ground and splash into the water, and our hero cheekily bares his, um, cheekilies to his foe and gets a good bite on the exposed area for his trouble. Eventually, after we make enough wrong choices to put otaku-san into traction for an extended period, we succeed in sending the yellow cat packing, and it's off to the next zone. The game doesn't seem to vary much from this formula -- at least, after an hour of play, I felt like I'd seen enough to get the idea. The graphics are quite nicely done, with digitized hand-drawn backgrounds and a loose, comical manga feel that's thoroughly Japanese in style. There's a lot of wonderfully over-the-top animation and voice work, but the gameplay is very linear. All we have to do -- all we can do, really -- is pick icons at random until something substantial happens, and while the events that unfold are amusing enough, there's no driving reason to progress. So that's Bakuden Unbalance Zone -- a resolutely Japanese game that would not have been high on anyone's localization list for US release. But it's been sitting on my shelf for a while, and it was fun and refreshing to mess around with it. Next time, I'll try to play something more accessible.